ZIMBABWE Olympic Committee president Admire Masenda on Wednesday said there was need to put in place deliberate strategies to ensure the country’s participation at the Rio Olympics is not by accident or a once-off event. Masenda was speaking during a fundraising dinner at Rainbow Towers in Harare where Team Zimbabwe for this year’s global sports showcase was announced. The Games will run from August 5 to 21 in Rio de Janeiro, Brazil, and Zimbabwe will be represented in seven disciplines — athletics, archery, equestrian, football, rowing, shooting and swimming. Masenda said they were grateful of the support they received from various stakeholders in preparing the team for the Rio Games before adding that there is need to come up with deliberate systems focusing on preparing athletes to qualify for the world’s biggest sporting spectacle. “Preparations for the Games were undertaken under difficult circumstances but supported by a myriad of stakeholders. We acknowledge principally the support of the International Olympic Committee, through the Olympic Solidarity and Rio 2016 Organising Committee, for the funding and programmes that have brought us thus far. “We also received support from the Government of the Republic of Zimbabwe through the Ministry of Sport and Recreation. “The national associations, the custodians of the participants, have participated in ensuring dreams of the athletes come to fruition. However, it is important to note that we must ensure that our representation is part of a deliberate and collaborative strategy, not an accident or one-off event,” said Masenda. Zimbabwe will be sending a delegation of 57 people — 31 athletes and 26 officials — which is one of their biggest contingents the country has sent to the Games. They will also be fielding a football team for the first time following the qualification of the Mighty Warriors last year. Guest of honour at the fund-raising dinner, Minister of Sport and Recreation, Makhosini Hlongwane, said the Government will always be supportive of Olympic sport in the country. “Government would like to commend all the athletes for their efforts and express its support for Olympic sport whose values of friendship, respect and excellence are crucial in development, cultural development and societal cohesion, peace, tolerance and fair play in sporting environments. “Indeed not only is sport a universal language but sport is also a school of life,” said Hlongwane. Hlongwane also took time to congratulate the athletes set to represent the country in Brazil. “To the athletes, I would like to congratulate those who have qualified for the 2016 Olympic Games. I edge you to shun unclean sports. Reject doping. Respect your opponents. Remember that you are role models. If you do that, you will inspire a generation,” Hlongwane said. 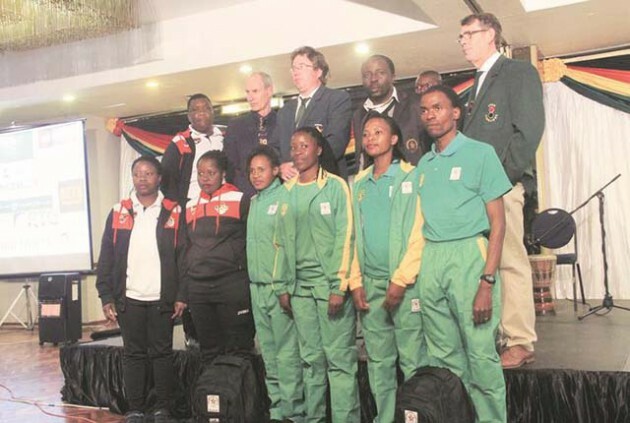 The function was attended by some of the members of Team Zimbabwe such as Michael Nicholson (shooting), long-distance runner Cuthbert Nyasango and Mighty Warriors pair of Rudo Neshamba and Felistas Muzongodi. National associations and representatives from different companies that have been supporting Team Zimbabwe were also present. ZOC chief executive Anna Mguni said they had 20 tables for sale ranging from $1 000 to $3 000 as part of their efforts to raise funds to support the team. “The tables went for different prices. Premium tables were going for $3 000, some were going for US$2 000 and US$1 000. We had 20 tables on sale. “We will be able to release the figures tomorrow (today),” Mguni said. Some of the companies that had sponsored tables include Mimosa, Old Mutual, MBCA, Nicoz Diamond, Zimplats, Tongaat Hulett, Dairibord Zimbabwe, BETA Holdings, RTG, First Mutual and CBZ. ZOC also unveiled the kit for the team sponsored by the Chinese Quanzhou clothes technology company, YINXINGDUN. Mguni said the sponsorship package is in excess of $50 000. The team will be travelling in batches with chef de mission Titus Zvomuya and administrative officer Memory Pakati expected to leave for Rio de Janeiro tomorrow. Nicholson and his coach Stuart Sylvester are flying out on Monday while the football team will leave on July 26 and the last batch of athletes for athletics leaves on August 18. Foreign based athletes will be flying to Brazil from their respective bases. Wirimai Juwawo, Gabriel Mvumvure, Pardon Ndhlovu, Rutendo Nyahora, Cuthbert Nyasango, Tatenda Tsumba. Benson Chauke (marathon); Phakamile Lisimati (sprints). Kudakwashe Bhasopo, Eunice Chibanda, Chido Dzingirai, Erina Jeke, Daisy Kaitano, Rejoice Kapfumvuti, Lindiwe Magwede, Rutendo Makore, Sheila Makoto, Talent Mandaza, Emmaculate Msipa, Lynett Mutokuto, Felistas Muzongondi, Rudo Neshamba, Marjory Nyaumwe, Samkelisiwe Zulu, Mavis Chirandu, Nobuhle Majika. Shadreck Mlauzi (head coach), Sithethelelwe Sibanda (assistant coach), Yohane Chikaola (assistant coach), Peter Masibera (goalkeeper’s coach), Dorothy Masawi (doctor), Sharon Mashingaidze (physiotherapist), Charity Mudzviti (manager). Danai Bhobho, Vaness Lunga, Ruvimbo Mutyavaviri, Nobukhosi. Medical: Austin Jeans (chief medical officer), Margaret Gibson, Madiki Machikicho, Nonhlanhla Mkumbuzi (all physiotherapists). Administration: Titus Zvomuya (Chef de Mission); Primrose Mhunduru, Memory Pakati.